We all deserve a chance to feel confident and it can begin with a beautiful and healthy smile. Our services range from routine teeth cleanings to more in-depth mouth reconstruction – which ever your need, we are here to provide you and your family with quality and experienced care. How Can Beaufils Dental Help You Today? At Beaufils Dental, we hold patient well-being and satisfaction to the highest regard. We are a comprehensive Cooper City dental office with an experienced staff who aims to provide a trusting and welcoming environment to each and every patient that walks through our doors. Equipped with state of the art technology and 30 years of experience, our Complete Health Dentistry services have helped patients restore their smiles to one they are confident in showing. Click a service below to learn more and to schedule a free consult. 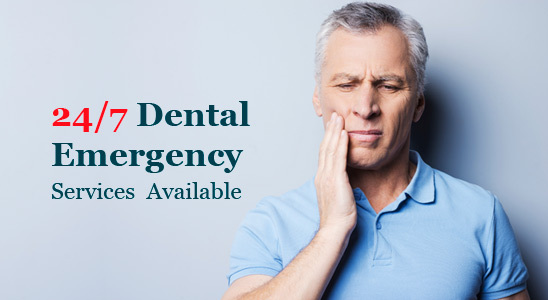 We understand that a dental emergency can occur at any time of the day, whether early morning at work or late at night while trying to sleep. Our dental office always aims to reduce or eliminate any dental discomfort that a patient may be experiencing, even if it’s after hours. For an extra fee, Dr. Lloyd Beaufils will make himself available and help you relieve any tooth or mouth pain you may be experiencing that same day. We understand that a visit to the dentist may not sound like the most easygoing experience. No matter which procedure you undergo, we guarantee that you will be treated professionally and with a painless ease that will have you returning to us with confidence. The team at Beaufils Dental values the importance of providing a safe and comfortable dental experience from start to finish, and we uphold these values through the use of modern dental technology. Our office is among the few in South Florida who utilizes 3D ICAT dental imaging technology. This revolutionary technology allows us to provide dental examinations with incomparable accuracy, helping us make the best decisions for your dental condition and delivering satisfying results. Put your oral health in the hands of a dentist who is available to assist you even during an unexpected dental emergency. Our office is conveniently located on Griffin Road in Cooper City, Florida. We are easily accessible from Davie, Hollywood, Weston, Sunrise, South West Ranches, Plantation, Miramar, Pembroke Pines, Fort Lauderdale, Dania, Lauderhill and Tamarac. Call us today at 954-252-1390 to schedule an appointment and learn about additional services we can provide you and your family, as well as our affordable payment plans. Our team is ready to help you achieve the healthy, glowing smile you desire.